Those involved in bridging community divisions in Belfast should be aware that the city was scarred by a prolonged period of unremitting sectarian and political violence long before the recent Troubles. 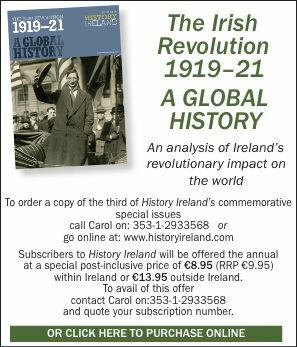 The black days of 1920–2, in which almost 500 people—mainly innocent civilians—died, coincided with the Irish revolution and the partition of Ireland. Michael Collins and nationalist politicians spoke of a carefully planned ‘pogrom’ by loyalist mobs and B Specials to drive the Catholic minority out of the city. For their part, Sir James Craig and his fledgling Unionist cabinet assured the British authorities that the appalling death toll—60 in May 1922 alone—was due to a ‘siege’ by the IRA, supported from Dublin. Now Alan Parkinson, a Belfast-born historian based at South Bank University, London, has produced the first balanced, detailed account of the tragic events of the early 1920s. Harnessing an impressive range of sources—official papers, police files, IRA records, newspapers and even witness interviews—Dr Parkinson traces the complex political background, communal fears and endemic sectarian hatred underlying the grim statistics. Most importantly, he writes with authority and humanity, carefully chronicling the exact circumstances of individual deaths. The Belfast outbreak erupted against the background of the escalation of the War of Independence between the IRA and Crown forces in the rest of Ireland, political uncertainty about the future of the North and the demobbing of thousands of ex-soldiers, brutalised by the horrors of the Western Front. June 1920 saw a bitter mini-civil war in Derry City involving the IRA, the UVF and British troops. As Parkinson points out, the IRA assassination of a hard-line Ulster-born RIC officer in Cork and an inflammatory speech by Sir Edward Carson at Finaghy provided the necessary sparks in Belfast. Carson—now bent on a policy of partition—told the assembled Orangemen: ‘We in Ulster will tolerate no Sinn Féin’. Within two weeks loyalist gangs expelled 10,000 Catholics and several hundred Protestant socialists from the shipyards, engineering firms and mills in Belfast and neighbouring towns. Over the next two years 23,000 people, mainly Catholics, were driven from their homes in the city. The Irish government estimated that 50,000 persons left the North permanently in response to the violence and intimidation of these years. Unlike during earlier sectarian troubles in the city, little effort was made by the British government or local Unionist leadership to have the expelled Catholics—dubbed ‘Sinn Féiners’ by their aggressors—reinstated. The chief secretary, Greenwood, chose to hide behind the principle of non-intervention in economic matters, and it was left to the Nationalist MP Joe Devlin to secure benefits for those in distress. In the wake of the July expulsions the city was raked by gunfire. Poignantly, the first victim was Mrs Margaret Noade, a young mother from the Short Strand, shot dead by police as she crossed Cromac Square. Over the next two years 500 people would die violently, of whom a staggering 58 per cent were Catholics in a city in which they numbered only 25 per cent of the population. In such circumstances the abiding nationalist sense of persecution is understandable. The author rejects the nationalist view that the anti-Catholic attacks of these years amounted to a ‘pogrom’ against the minority, and documentary evidence is hard to find. However, the repeated assaults on such isolated Catholic enclaves as the Short Strand suggest a considerable measure of pre-planning, and the British prime minister, Lloyd George, admitted to Winston Churchill in June 1922 in relation to the Belfast bloodshed: ‘Our Ulster case is not a good one’. Sir James Craig, the future Northern Ireland prime minister, was able to use the Belfast disturbances to persuade Lloyd George to establish the sectarian Ulster Special Constabulary (USC) as an auxiliary police force based on the pre-war UVF. To nationalists the USC were nothing more than ‘the dregs of the Orange lodges’, but to Craig and his beleaguered cabinet they guaranteed the establishment of the Northern state against determined nationalist resistance. Distrustful of the police, Belfast nationalists looked to the local IRA for protection. As Parkinson points out, the republican force was relatively weak in the city, though in the wake of the Treaty it received valuable moral and military support from Michael Collins. Collins was pursuing his ‘twin-track’ approach of conciliation and coercion in his efforts to force the North into the new Irish Free State. While the Belfast IRA saw its role as essentially defensive, it was active in assassinating RIC personnel and in the sectarian bombing of shipyard trams. IRA attacks were to provoke harsh reprisals by a ‘murder-gang’ within the police force, using the same tactics as the Black and Tans were employing in the south. Dr Parkinson has no doubt that senior police figures such as County Inspector Harrison and the deeply sectarian District Inspector J.W. Nixon (later a Stormont MP) were heavily implicated in a series of murders of Sinn Féin supporters and Catholic civilians during 1920–2. The mounting bloodshed led the Republican Dáil in Dublin to impose the ‘Belfast Boycott’ against Belfast banks and businesses in 1921. But, as the Sinn Féin writer P.S. O’Hegarty noted, this was both ineffectual and counter-productive, stereotyping partition and alienating moderate Unionist opinion. The 1921 Treaty, with its provision for a Boundary Commission to revise the border, raised both nationalist hopes and unionist fears. The result was what Winston Churchill, the colonial secretary in charge of Irish affairs, called ‘a return to the hideous bog of reprisals’ in early 1922. An IRA ambush of a trainload of Specials at Clones in February sparked off a chain of barbaric atrocities in Belfast. Among these was the mass murder by loyalists of six children in Weaver Street, a Catholic district off the Shore Road. On 22 March 1922, under cover of curfew, a gang of men in police uniform carried out the almost ritualistic murder of Owen McMahon, a leading Belfast publican, his three sons and an employee at their villa off the Antrim Road. Dr Parkinson correctly identifies rogue members of the police as responsible for this atrocity, described by Churchill as an act of ‘cannibalism’. A few days later Catholic extremists bombed the home of a poor Protestant family, killing two children. The McMahon horror moved Churchill to bring Craig and Collins to London for urgent talks on how to end the killing. The resulting Craig–Collins pact contained radical proposals for recruiting Catholics into the Specials and promoting conciliation. However, it was soon washed away in a ‘sea of blood’. By June 1922 Belfast was in a state of virtual civil war involving security forces, loyalists and the local IRA, now involved in a major military offensive secretly authorised by Collins. It was not until the outbreak of the civil war in the south that peace slowly returned to the city. However, the savage violence bequeathed a legacy of bitterness and division that affected the ‘psyche’ of both communities. Nationalists felt beaten and demoralised and abandoned by the South after the death of Collins. The Unionists had won. Dr Parkinson has written a sharp, compelling study of a critical epoch in the history of the Northern state. By dealing dispassionately with the 1920s’ conflict he shows why reconciliation remains a challenge for today’s political leaders.